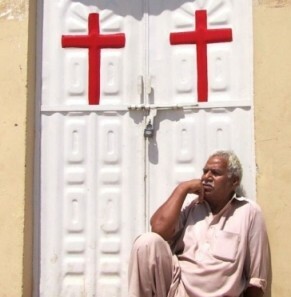 Life on any given day for Pakistani Christians is difficult. But members of Pakistan's Christian community say now they're being persecuted for U.S. drone attacks on Islamic militants hiding on the border with Afghanistan. The minority, which accounts for an estimated one percent of the country's 170 million population, says because its faith is strongly associated with America, it is targeted by Muslims. When America does a drone strike, they come and blame us, Faisal Massi, a 25-year old student from Sau Quarter, a Christian colony in Islamabad. They think we belong to America. It's a simple mentality. Not only is it a "simple mentality"—indeed, Muslim tradition holds that "All infidels are one religion"—it's also a convenient one, whereby Muslims avenge themselves on the "strong infidel" (the "Christian" West) by attacking the "weak infidel" (Christian minorities living under Islam). Examples of this approach are many: years ago, when Pope Benedict quoted history deemed unflattering to Islam, anti-Christian riots ensued, churches were burned, and a nun was murdered in Somalia; weeks ago, when a fringe American pastor burned a Koran, dozens of U.N. aid workers were killed by Muslims in Afghanistan, some beheaded. Even a breach by a single individual dhimmi could result in jihad being enacted against the whole community. Muslim jurists have made this principle explicit, for example, the Yemeni jurist al-Murtada wrote that "The agreement will be canceled if all or some of them break it" and the Moroccan al-Maghili taught "The fact that one individual (or one group) among them has broken the statute is enough to invalidate it for all of them" (The Third Choice, p.160). Accordingly, months ago, when a Christian man in Egypt was accused of dating a Muslim woman, twenty-two Christian homes were set ablaze to cries of "Allahu Akbar." Days ago, when Muslims made false accusations against a Copt, one Christian was killed and ten hospitalized, an old woman was thrown out of her second floor balcony, Christian homes, shops, fields, and livestock were plundered and torched—to cries of "Allahu Akbar," per a report aptly titled "Collective Punishment of Egyptian Christians." Thus, as the world shrinks—and as Muslims continue to conflate the West with Christianity—the reasons to persecute Islam's Christians grow: ethnicity and geography no longer matter; shared religion, even if nominal, makes all "Christians" liable for one another. A dhimmi is a dhimmi is a dhimmi. And if it's more convenient to punish the Muslim world's defenseless Christians in response to the West, so be it—even if the latter remains oblivious or indifferent.